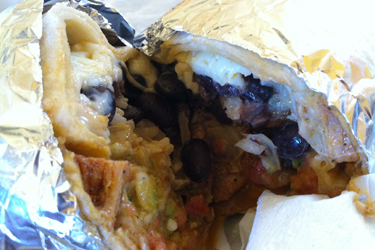 N and R both went to San Jose State, and lived in the same dorms (where they met; and during that time they found a few pretty cool burrito places in the city, including Iguanas. 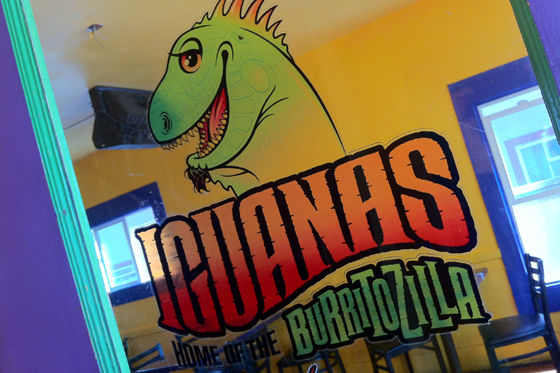 Now of course, nothing could ever stand up to the ridiculous awesomeness we have in San Francisco, as witnessed by N’s epic burrito taste test last year, but the Burritozilla at Iguanas ( a 4lb. 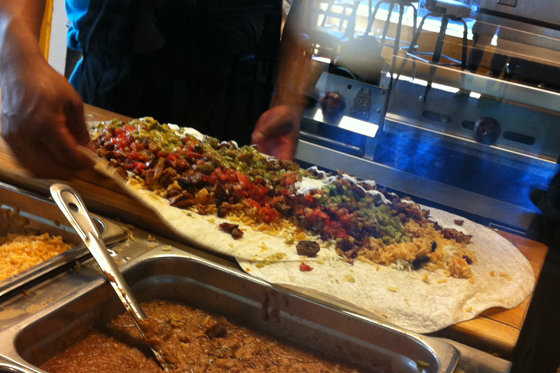 burrito, even featured on Man vs. Food) was definitely an eyebrow raiser to say the least. 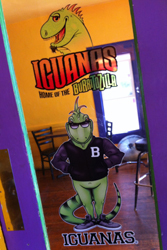 Since we’re in San Jose visiting R this weekend, I thought a trip to Iguanas and a Burritozilla was definitely in order. Yesssss. 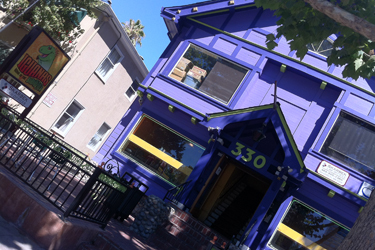 Iguana’s is in what used to be a little house, that has since been painted a pretty distinctive purple (it wasn’t this way when N and R were going to school here), but it’s pretty cool now. 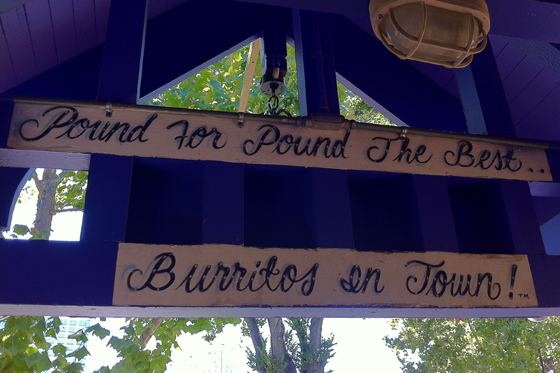 It was a bit harder to find before they became super popular for the Burritozilla. Ha ha ha! 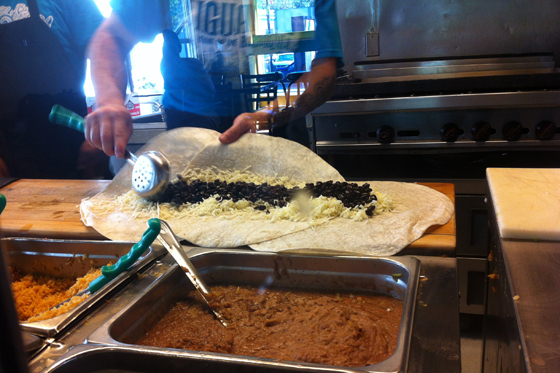 With a “normal” burrito being around five bucks, the Burritozilla at around TWENTY seems a little crazy, but hello – it’s several burritos in one. It’s good for a party, or just for several friends to split. We ordered one and enjoyed the show. Niiiice. 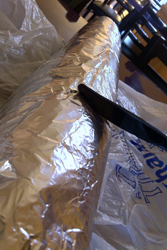 After all that, they finish wrapping, encase it in foil, and toss it in a bag for you. 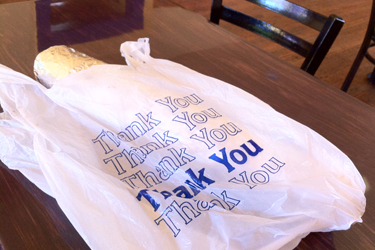 Uh … okay wait, the burrito doesn’t even fit in the BAG. 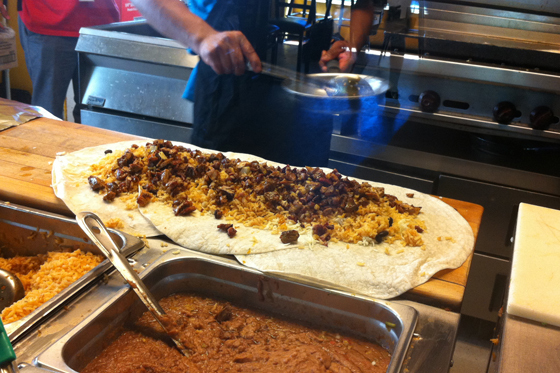 That’s a HUGE … burrito. Alright – time to taste. I’m gonna cut a *small* portion of this monstrosity. YUM. This was GREAT. 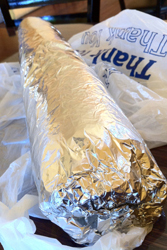 Yeah, the main thing is how humongoid this burrito is, but really, Iguana’s does a really good job at making quality burritos fresh and to order. Their ingredients are great, and they’re fast, which is really what it’s all about here (since they already have the good quality down pat).). Oh, my goodness, oh, my goodness!